This 4 inch x 10 feet Exhaust Duct is ideal for connecting a laser to an exhaust fan or to a metal duct. It is sized perfectly to slide over the 4 inch exhaust port on laser systems. The smooth walled duct is easily cut to length using a fine bladed saw. The Exhaust Duct is flexible and helps to isolate vibration and noise from the exhaust fan. Two 4 inch clamps are included to secure the duct. The clamps tighten easily with a screwdriver. PLEASE NOTE: Do not use plastic dryer vent hose as an exhaust duct for your laser. 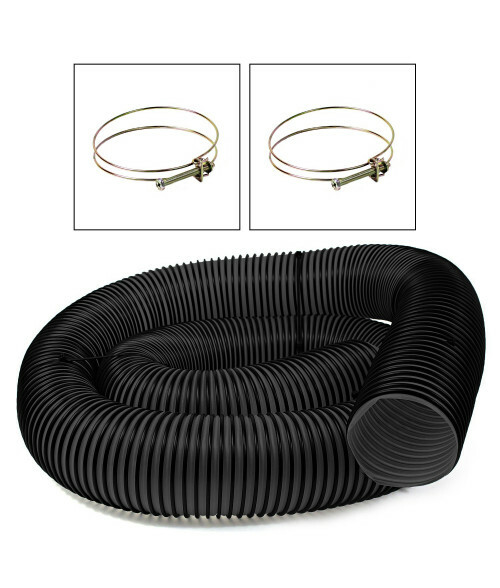 This type of coil hose design will reduce air flow and may collapse under the pressure.